Mill Creek Incinerator in Cloverdale circa October 1968. The incinerator's tower with smoke billowing is visible to the right of the photograph. Image courtesy of the City of Edmonton Archives EA-20-6444. Perhaps the desire to burn our waste comes from a primeval desire to cover our tracks. And our smells. Incineration of garbage predates the public collection of garbage in North America. And a backyard firepit remains a symbol of rugged self-sufficiency in some circles, even though burning garbage has been outlawed for years. On the face of it, burning seems like a neat solution to a nasty problem. Incineration has been the preferred method for dealing with toxic medical waste since the invention of the modern hospital. The first recorded incinerator in Edmonton was constructed with the Royal Alexandra Hospital in the early 20th century. Incinerating medical waste prevented the spread of disease. At Edmonton’s east end flowed the evocatively named Rat Creek, one of the city’s early “nuisance grounds” (a unique Canadianism for “dump”). In 1908, Rat Creek witnessed the construction of the city’s first public incinerator, a state-of-the-art facility that would burn fifty tons of garbage a day. Edmonton pushed the Rat Creek incinerator to maximum capacity, however, and the smell wafted westward toward the neighbourhood of Norwood, inciting the “wrath of a large delegation of citizens.” Rather than composting horse manure, some citizens simply burned it in the incinerator, creating what one man called “a Turkish cigarette aroma” throughout the city. Commonwealth Stadium now sits on the grounds of Edmonton’s first masterplan for burning garbage. Rat Creek Incinerator circa 1913. Photographed by Mrs. Gladys Hanson. Image courtesy of the City of Edmonton Archives EA-232-1. Rat Creek Incinerator, interior photograph of men working, circa 1913. Photographed by Mrs. Gladys Hanson. Image courtesy of the City of Edmonton Archives EA-232-2. Modern incineration was a British invention. Edmonton’s second incinerator was built using the British model established in Leeds at the end of the 19th century. According Susan Strassner, the Leeds incinerator was an industrial-age behemoth, capable of burning 60 tons of garbage a day. The unintended consequence of large-scale burning included a noxious smell and fly ash, which engineers attempted to fix by almost tripling the height of the chimney to 150 feet. Edmonton turned to the British firm of Heenan and Foude to build the southside incinerator. It would be a safe 200 yards from the closest home. The incinerator boasted one rectangular furnace and a combustion chamber. Its chimney measured 100 feet tall. Mill Creek Incinerator in Cloverdale circa October 1968. The incinerator’s tower with smoke billowing is visible to the right of the photograph. Image courtesy of the City of Edmonton Archives EA-20-6444. Edmontonians weren’t convinced. The problem with the Mill Creek incinerator was that it wasn’t big enough to absorb the post-war economic boom. While some argued that the incinerator should be moved out of town or modified, the decision was taken in 1950 to build a brand spanking new incinerator on the site of the old incinerator. Despite increasing evidence that incinerators were creating hazardous levels of air pollution in places like Los Angeles (which had long burned garbage in backyards), Edmonton pushed on, hiring a Montreal-based company to build a new mechanized incinerator in Mill Creek. 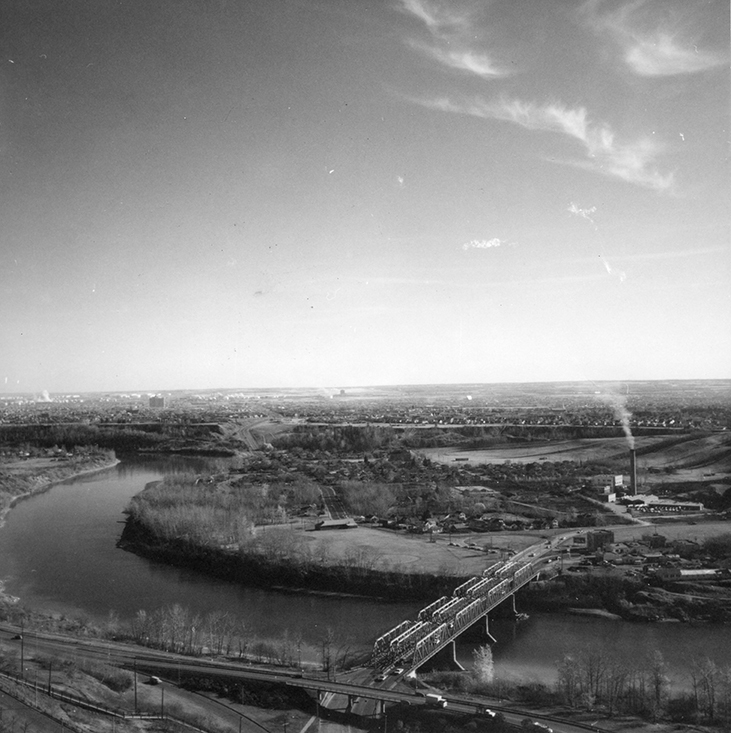 By 1954, Edmonton was back in love with incineration. A series of glowing articles in the Edmonton Journal detailed the specs on the new incinerator. With the unprecedented capacity to burn 290 tons of garbage a day, the Mill Creek Incinerator was to be the final answer to the problem of the city’s dumps. Unlike previous models, this incinerator could handle practically every kind of garbage you could throw at it, including wet sewage and sludge. There would be no more dumping into river or ravines. Forty city garbage trucks, along with private vehicles, delivered their loads every day. The vehicles passed through steel doors and dumped their loads into a pit. The pit was twenty five feet deep and eighty feet long. A three-and-a-half ton traveling bucket scooped waste and dumped it into hoppers. The whole thing was directed by an operator in a crane cab above. The operator opened grates for the garbage to drop onto furnaces where temperatures burned at 1800 degrees Fahrenheit, hot enough to turn food tins into ashes. Another chamber dealt exclusively with dead animals. Ten men worked around the clock to keep the whole operation going. Problems with the mega-project began before work was even complete. There was sniping between the City Architect and the construction firm. The considerable delays were over by 1955, but the City was not happy. An inspection of the new plant found potholes in the floor, along with coal deposits. The boiler room flooded. Nearby residents complained of fly-ash and noxious smells. Mill Creek Incinerator, interior photograph of the hydraulic system circa 1958. Image courtesy of the City of Edmonton Archives EA-75-801. A sprinkler system built in the early 1960s was constructed in a vain attempt to cut down on the ash. The Edmonton Journal ran an article that might have anticipated The Onion, calling the incinerator “downtown’s tourist attraction.” The sight of the massive structure burning tons of garbage was in full view of south-facing rooms in the elegant Hotel MacDonald. No matter how hard engineers tried to tweak the incinerator, calls to shut down the behemoth only grew louder. By 1970, the Gateway reported that DDT was being burned in the incinerator. Its furnaces could not keep pace with a booming city and a post-war plastic culture. People dumped mattresses and car parts outside the premises. A reporter from the Journal ventured onto the grounds of the incinerator to find telephone books, milk cartons, tin cans, grass cuttings, license plates, bed springs, oil drums crawling up the hill near the Ski Club. The incinerator couldn’t burn it all fast enough. The grounds were swarming with flies and seagulls. By 1971, the City had united against the incinerator. “Incinerator finally closed,” was the headline of an Journal article from that year. Only fifteen years after its auspicious inauguration, the city’s principal eyesore was destroyed to make way for one of two of its enduring treasures: Mill Creek Ravine and the Muttart Conservatory. By the 1980s, the dream of incinerating a city’s garbage was a distant memory. A 1986 study by the engineering firm GCG Dillon found that, apart from some private recyclers who paid for glass, aluminum, and paper, the vast majority of Edmonton waste went straight to landfill. The largest landfill at Clover Bar was going to reach maximum capacity within a few years, however. By 1990, then-Premier Don Getty and Alderman Brian Mason were publically wondering about the feasibility for a new generation of incinerators. While municipal officials from across the Canada still thought landfills were still the cheapest and safest way of getting rid of garbage, there was a growing citizens’ movement against dumps. The modern environmental movement was in full gear; it set its sights on the hazards of landfills, not incinerators. The prospect of an incinerator that could not only burn waste but could also convert the process into energy was exciting enough that incinerators were back on the table. Plus ça change. Susan Strassner, Waste and Want: A Social History of Trash. New York: Holt, 2000.